Thanks for visiting Maryland butterflies. This small East Coast state hosts approximately one hundred and sixty butterfly species. A changing climate and other factors means that their population levels change over the years, some long term, some short term. The top picture shows a Horce’s Duskywing. It’s found in Open oak woods and marshes throughout the state. The list of Maryland butterflies presented here is divided by family and includes pictures of representative species. 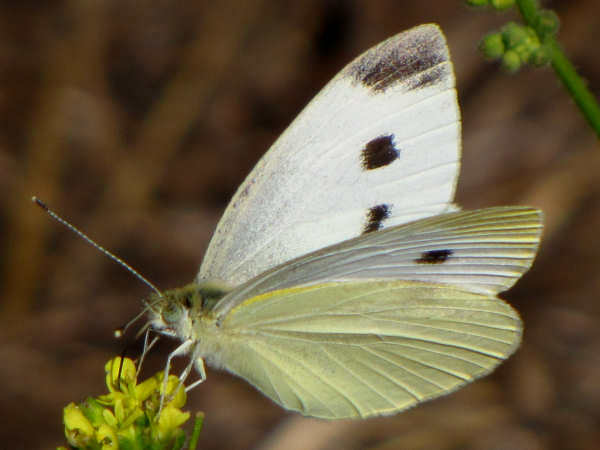 Cabbage White butterflies originated in Europe and unintentionally arrived in the United States in the mid-19th Century. Since then, they expanded their range from coast to coast. They will be very common in Maryland gardens. 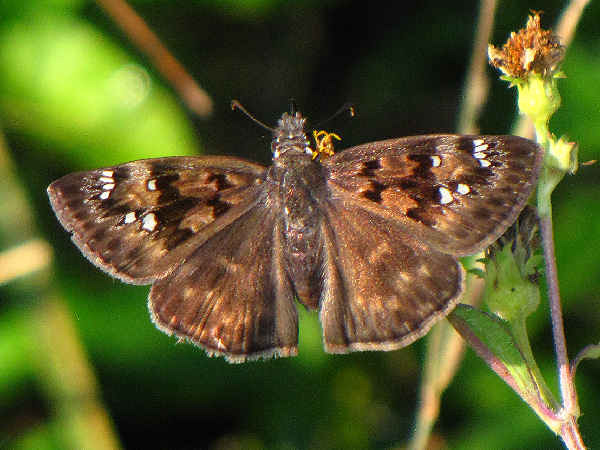 Males have one black spot on the top wing. Females have two black spots. Along with the Falcate Orangetip, they are the two white butterfly species with a state wide distribution. Yellow butterflies in Maryland are similar to species all over the Mid-Atlantic seaboard. The Southern Dogface and Large Orange Sulphur have mostly a southern range. The remainder of the yellow butterflies have a state wide range. The picture shows a Little Yellow butterfly. 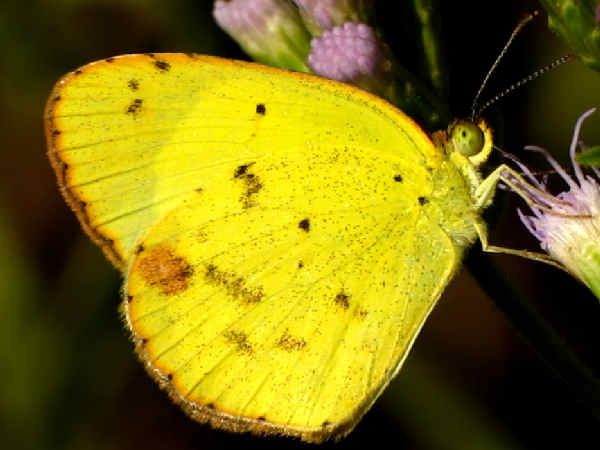 Along with the Dainty Sulphur, they rank as the smallest of the yellow butterfly species with wings around one inch in length. Anywhere one travels in Maryland will be a great spot for seeing hairstreak butterflies. Seven of the twenty some species have a state wide distribution. Along with the regional specialties, up to ten or more hairstreak butterflies could be found in any place during the butterfly season. 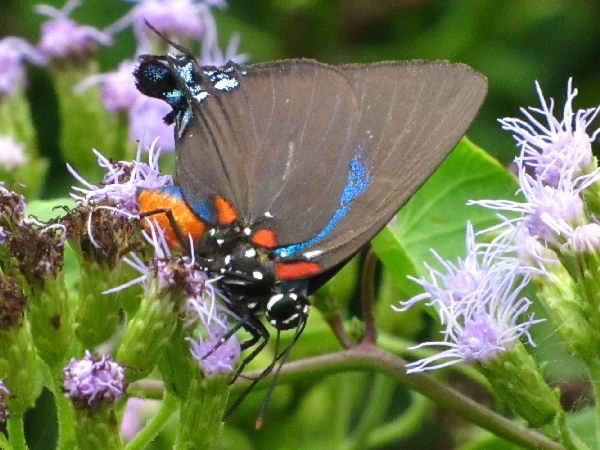 The Great Purple Hairstreak is really one great butterfly. It’s larger than the average sized hairstreak and characterized by one short and one long tail on hindwing. As the picture shows, the side of the butterfly shades purple with metallic gold markings near the tail. Abdomen is blue on top and red-orange underneath. They are one of the regionally distributed species. Look for areas in the coastal plain with mistletoe, the larval host plant. Eastern Tailed-blues and the Spring and Summer Azures will be the most common blue butterflies seen by tourists and residents alike. They have a state wide distribution. The picture shows a Summer Azure. 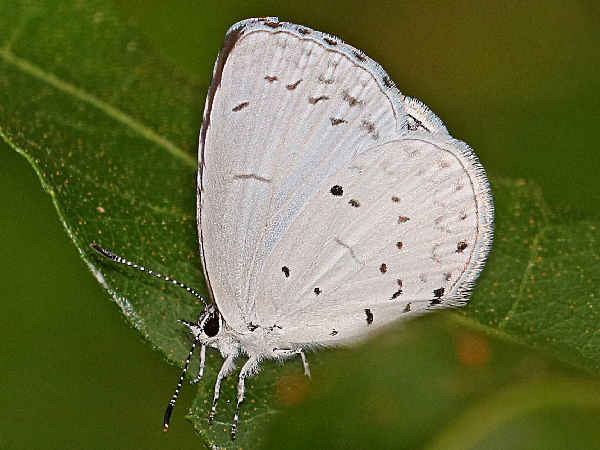 The other Azure butterfly species are Appalachian Mountain region specialties. Maryland gardens are filled with orange winged butterflies, and most belong to the Brush Footed family. It is important to note that in the family, the types of butterflies one might see as a tourist or resident is dependent on the ecosystem. Maryland documents the existence of its butterfly species according to five such ecosystems: Appalachian Plateau (AP), Ridge & Valley (RV), Piedmont (PD), Upper Coastal Plain (UC), Lower Coastal Plain (LC), or Coastal Plain (CP). Very few of the Brush Footed species are documented state wide. The Gulf Fritillary, for example, gets characterized as a stray insect in the Coastal Plain and the Piedmont regions. Speaking of fritillaries, most of Maryland’s species are fairly easy to identify once spotted. Photographers should get pictures of the top of the wings and a side view with the wings folded to help with the identification process. 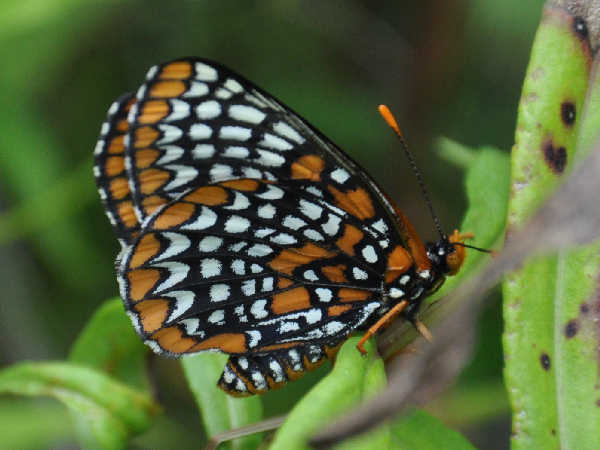 The picture shows a Baltimore Checkerspot the official state butterfly of Maryland. It’s range does extend outside the state. Apart from the Applachain and Palamedes Swallowtails, all of Maryland’s swallowtail butterflies can be found state wide. 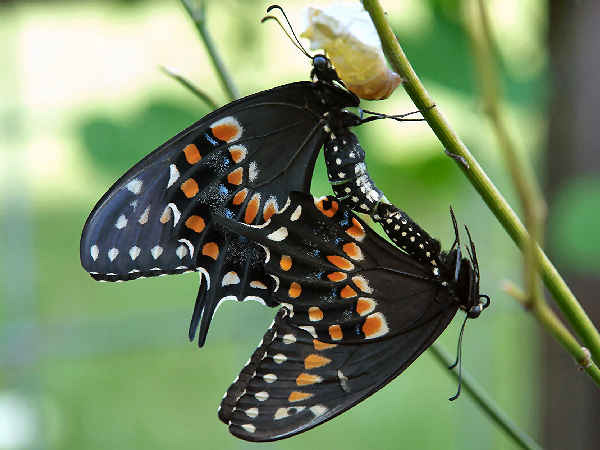 The larvae of this Pipevine Swallowtails use Dutchman’s pipe as the host plant, hence the name. Somewhere in the Pipevine Swallowtail story the discussion of chemicals in the plant that make adults a toxic food source for birds also gets discussed. Appalachian Tiger Swallowtails are the other regional species, of course in the western mountain area. The remaining swallowtail species have a statewide distribution. Look of the Zebra Swallowtail, for example, anywhere Pawpaw trees are present. They are the host trees for the caterpillars. Two metalmark species, the Little Metalmark and the Northern Metalmark also find a home in the state.